China issued the first-ever group of visas with ten-year validity to U.S. citizens on Wednesday, implementing a new agreement that is expected to boost exchange between the two countries. 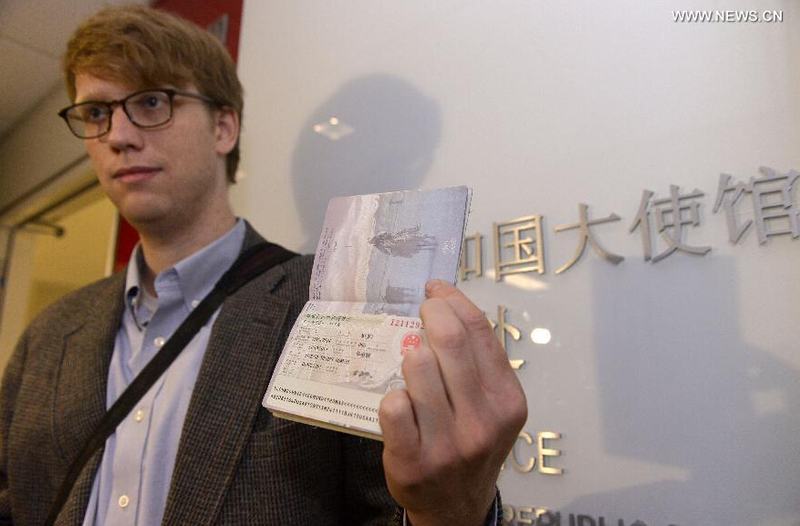 Edmund Thomas Downie shows his visa to the press after becoming the first American citizen to be issued a ten-year visa at the Visa Department of the Chinese Embassy to the United States in Washington D.C., Nov. 12, 2014. At the visa office of Chinese Embassy in the U.S., 23-year-old researcher Edmund Downie became the first American to receive the ten-year visa with multiple entries. In what will be his fifth trip to China, he planned to travel to southern Chinese city Kunming and stay there for about a week. "I am glad that I've been granted the honor of being the first American to receive the ten-year visa," Downie told Xinhua. "I am excited to be able to keep going to China for the next ten years and not have to worry about coming back to the visa office." Starting Wednesday, under a new agreement announced during the Asia-Pacific Economic Cooperation summit in Beijing, China and the U.S. will grant each other's citizens business or tourist visas with maximum validity of ten years. The validity of student visas will also be extended to up to five years. "It eases the process of visa acquisition and makes it more affordable," Downie said of the new arrangement, adding that it is a positive step for Americans to learn more about China. Ruan Ping, Consul General at the Chinese Embassy in the U.S., believed that the new visa policy will enhance mutual understanding between China and the United States. "It will greatly promote the people-to-people exchange between China and the U.S. and boost our economic and academic ties," Ruan said. Earlier Wednesday, U.S. Secretary of State John Kerry handed out the first ten-year visas to a group of Chinese citizens in a ceremony at the U.S. Embassy in Beijing. "You are literally helping to write the next great chapter of the history between the United States and China," Kerry told the Chinese citizens with the new visas and people at the ceremony, according to the U.S. State Department. "This will pay huge dividends for American and Chinese citizens and it will strengthen both of our economies," he added.